The Burren Cycle Route is a moderate 1 to 3 day (150km or 100 miles) looped scenic cycling trail through the Burren National Park, a Unesco World Heritage Site and one of the most dramatic and unique landscapes in the world. The Burren is a rocky karst landscape in County Clare on the west coast of Ireland and on the Wild Atlantic Way. 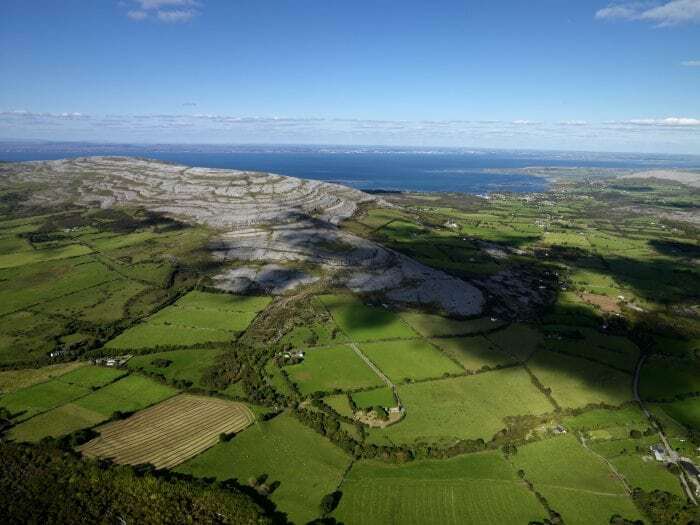 The Burren or Boireann in Irish, meaning 'great rock' is approximately 250 square kilometres and encompases the main villages of Ballyvaughan, Kinvara, Corofin, Kilfenora, Lisdoonvarna, Ennistimon, Lahinch, Liscannor and Doolin. The Burren Cycling Loop map below starts in the picturesque town of Ballyvaughan but you can start and rent bikes at any number of villages and towns along the route as shown on the route map below. At a casual speed and visiting local attractions along the way, this route could be done in a glorious 4 days with the cycling route broken up into a number of smaller loops or made shorter to suit your holiday. The 150km route follows mainly minor country roads and combination of smaller loops allows a number of options of varying length, difficulty and areas of interest. The trail travels through spectacular and varied territory that is dotted with viewing spots, coastlines, cliffs, beaches, mountains, hills, caves and rivers. There are many top attractions to mention along the route including the Cliffs of Moher so be sure to stop and savour whats on offer and plan your route to visit the ones that interest you. You can also take a side trip at Doolin and take a ferry to the wonderful Aran Islands where you can continue your cycle or continue south to do a coastal cycle loop and Heritage Trail on the Loop Head Peninsula.